WASHINGTON — Six Flags America is closing its Apocalypse stand-up roller coaster. Six Flags America in Upper Marlboro, Maryland is planning a new thrill ride for next season, and that means closing one of its existing rides. News of the closure comes on National Roller Coaster Day. The roller coaster Apocalypse: The Last Stand will close forever on Saturday, Sept. 8. 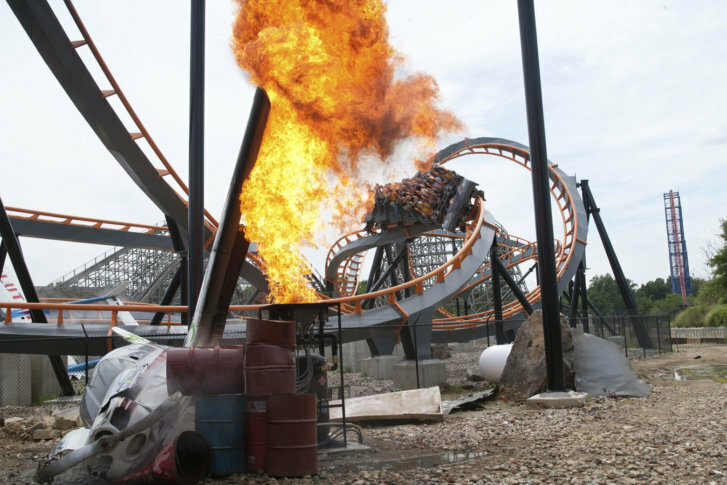 Apocalypse debuted at Six Flags America during the 2012 season. Six Flags says since then, it has given more than 1.6 million rides. The stand-up roller coaster is set among thematic elements, including a plane crash, explosions and zombies. It features two high-speed inversion and several twists, turns and drops. “Our wheels are always turning when it comes to new and innovative thrills and attractions to bring to the park,” said Six Flags America President Rick Howarth. Howarth did not say what new ride would replace it. Six Flags America has several other roller-coaster rides in its park, including one of the first virtual reality roller coasters in the country, Superman – Ride of Steel, and dozens of other rides. Six Flags America is one of 25 parks across the U.S., Canada and Mexico owned by Six Flags Entertainment Corp., the largest regional theme park company and largest operator of waterparks in North America. It had $1.4 billion in revenue in 2017.